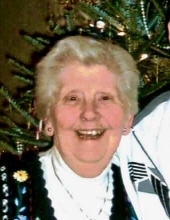 Doris E. LaCasse, 95, of Windham, wife of the late Donald E. LaCasse Sr, passed away Saturday March 23, 2019. She was the daughter of the late Louis F. and Albina (LeClaire) Guillotte of Jewett City, CT.
Born on December 17, 1923 in Jewett City, she married Donald E. LaCasse, Sr. in Jewett City on May 31, 1944. Doris and Donald loved to dance to the big band sounds of the 1940s. They danced their way through 61 years of marriage. Doris also loved traveling and camping with her family. She retired from the University of Connecticut, having served as a secretary in the College of Agriculture. She was preceded in death by her parents, an infant son, Richard and a daughter, Susan (LeBoeuf). She is survived by two sons, Donald, Jr (Judith) and James (Cathy); a daughter , JoAnn Klein (Don) and by six grandsons and two granddaughters as well as eight great-grandchildren. The family would like to thank the staff of Douglas Manor in Windham for their care of mom over the past 4 years. Funeral services will be held Thursday March 28, 2019 with a Mass of Christian Burial at 12PM directly at St. Joseph Church 99 Jackson St, Willimantic with a visitation from 11AM until the Mass. Burial will be private at the convenience of the family. In lieu of flowers, donations may be made to the Cystic Fibrosis Foundation CT. Chapter 101 Centerpoint Dr, Suite 107, Middletown, CT. 06457. To send flowers or a remembrance gift to the family of Doris E. LaCasse, please visit our Tribute Store. "Email Address" would like to share the life celebration of Doris E. LaCasse. Click on the "link" to go to share a favorite memory or leave a condolence message for the family.